Acne has many causes and triggers, some you can do little about, like genes and hormones. Others are external- which means there are things we can do. A proper skincare routine can help a lot. Unfortunately sometimes the products we use on our skin in an effort to clear acne can actually make the problem worse. A common misconception about treating acne is that oil needs to be avoided and must be removed from the skin as often as it appears. However, our skin needs to retain it's protective layer of oil to stay balanced. This natural protection is a complex lipid mixture called sebum. Sebum is composed of triglycerides, wax esters, squalene, and fatty acids. It’s an oily substance secreted from glands at the base of our pores and hair follicles that’s purpose is to waterproof and protect our skin and hair. The fatty acids that sebum contains can vary. Acne prone skin has been found to be deficient in the essential fatty acid known as linoleic acid, and higher in oleic acid. Also found to be typical in acne prone skin is a faster rate of sebum production. These two findings help us in our quest to reduce acne flare-ups. First, we can make sure that the oils we are using on our skin are oils with a high amount of linoleic acid and a low amount of oleic acid. As the oil you apply to your skin mixes with the sebum in your pores, it changes the texture of the sebum. Sebum high in oleic acid is thicker and more sticky, making it more likely to clog pores and trap sweat, dirt, pollutants and bacteria, which can all contribute to breakouts. Sebum rich in linoleic acid will have a thinner and more fluid consistency, which is less likely to clog pores. Over time, as your pores are consistently filled with this thinner substance, pore size will naturally become smaller. Linoleic acid is also naturally anti-inflammatory so it addresses the inflammatory types of acne including pimples, red pustules, cysts and inflamed comedones. The second and equally important part to this treatment method is to slow the production of Sebum. When we strip the oil from our skin with ingredients like soaps, acids, and alcohol, sebum production ramps up to fill the void. This overproduction of sebum leaves our skin looking oily, and since there is too much sebum (that potentially has a sub-optimal composition) it’s a lot easier for dirt and bacteria to become trapped and cause blemishes. In order to avoid stripping your skin of oil you can use the oil cleansing method instead of soap-based cleansers which are more common today. Since oil mixes easily with other oils and wax esters it makes perfect sense that it would do the best job of cleansing your pores of sebum that has become filled with impurities. 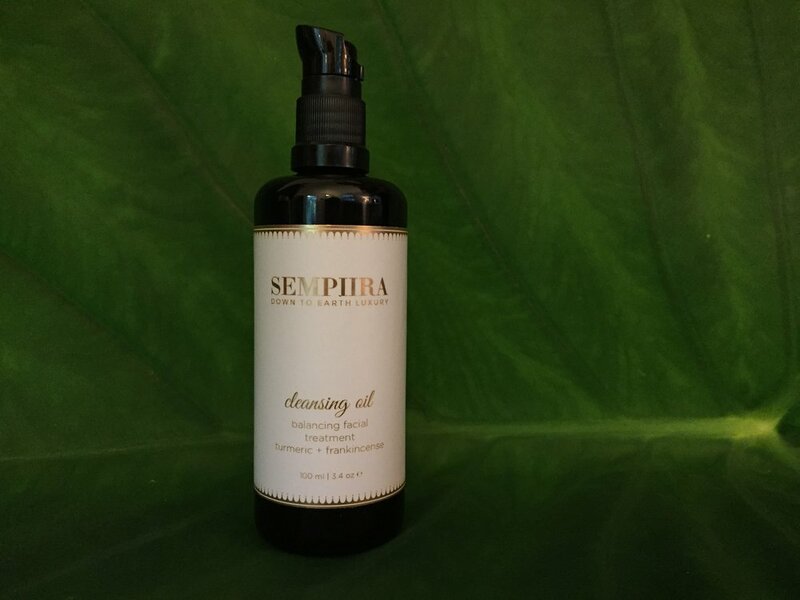 The oil cleansing method involves massaging an oil cleanser into dry skin, allowing it to penetrate pores and then wiping it away with a hot washcloth. Hardened sebum is loosened and washed away, immediately replaced with clean oil so your skin’s lipid layer is replenished and does not have to produce excess sebum. With daily use this method can help you achieve balanced skin in as little as a few weeks. An ideal regimen for treating acne would include an oil cleanser, a gentle oil-based exfoliant, and a moisturizer, all made of primarily oils rich in linoleic acid and other anti-inflammatory and anti-bacterial ingredients. We created our Cleansing Oil, Chlorophyll Exfoliant and Clarifying serum specifically with acne-prone skin in mind. They all contain linoleic acid rich oils and anti-inflammatory and anti-bacterial essential oils and CO2 extracts. Another component of treating acne is gentle exfoliation, to remove dead skin cells that can block pores. Daily cleansing with our Cleansing Oil provides the most gentle form of exfoliation by removing the oil with a soft cloth. This might be perfect if your skin is highly sensitive and inflamed. As your skin heals and becomes less raw, The Chlorophyll Exfoliant is ideal as a once or twice-weekly mask and exfoliating cleanser. Following cleansing, apply the Clarifying serum to fully hydrate and replenish skin with the right kinds of oils to keep acne at bay. Since these three are so perfect together, we’ve made them into a set which you can find here. When you buy them together, you save 10%. Cheers to calm, clear and happy skin!